Great work, the navigatrix conversion is very cool. Looking very nice, love the deep rich blue and the diving helmet. It's funny you mention them looking like Cawdor, I had intended on converting Chaos Cultists into a Cawdor gang a little while back. 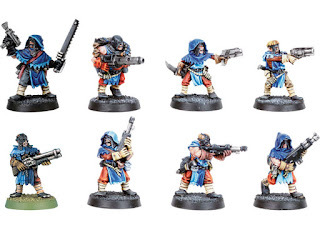 This was before the release of the new Necromunda and it seems I took so long about it that we're actually getting new models for them soon anyway. Ha! Well, I'm sure the new Cawdow will be super and you'll be able to build the gang you've always wanted. Thanks a lot Mark! More to come.